I’ll be honest; I don’t think I’ve ever appreciated a lettering designer before Nate Piekos in this bind-up. I know that sounds awful, but I always get so wrapped up in the story, the art, the coloring, that I get too distracted to pay the proper respect to the lettering. 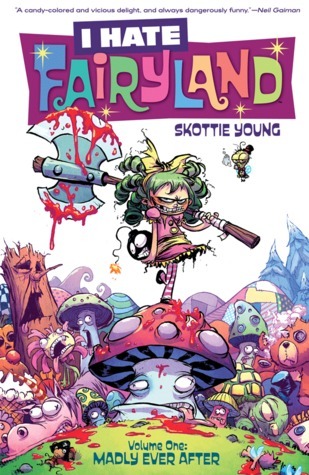 But in I hate Fairyland, Vol. One: Madly Ever After the lettering completely made this graphic novel for me. I don’t mean to sell the story, art, or coloring short; they are also amazing. This story is whimsical and hilarious, while being bright and dark at the same time. I will put a disclaimer out that this graphic novel is very, very gory, but I think it’s well done and creates and amazing juxtaposition for the world our main protagonist is stuck in. Gertrude, like many little girls, wishes for a new magical world, but, unlike many little girls, Gertrude gets her wish and falls into Fairyland. Unfortunately, she soon realizes that getting home will not be as easy as she thought. We then get to see Gertrude twenty-seven years later, but still trapped in her same little girl body since bodies don’t age in Fairyland. Gertrude is now jaded, bitter, and borderline insane with a thirst for vengeance and on a mission to find a key. Fairyland is amazing and feels like a brand new Alice in Wonderland with a twist. I would completely recommend this to anyone that won’t be bothered by a little blood, guts, and deranged children killing things. I’m now going to break down each issue in this bind up. There will be SPOILERS, so please use caution in continuing if you have not read this graphic novel! We meet Gertrude and see her wish for a new world, then her falling into Fairyland. We meet Queen Cloudia, who rules Fairyland, and she gives Gertrude a guide named Larrigon Wentsworth III (or Larry) and a map to all the known lands. If Gertrude wants to return home, she will have to find a hidden key that will unlock a door to her world. We then see Gertrude twenty-seven years later, still searching for that key. Even though Gertrude is on a very self destructive path, killing anything in her way, Queen Cloudia can’t do anything because Gertrude is still considered a guest in Fairyland, and harming her is against the rules. Queen Cloudia decides she is going to ask for help, since she cannot stop Gertrude herself, so she hires a witch named Horribella. 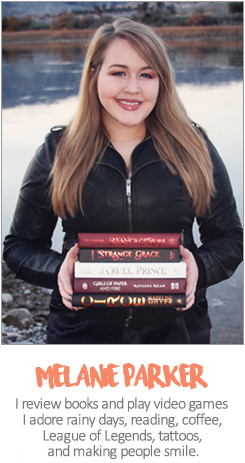 She sets up a zombie army, who Gertrude and her trusty guide Larry have to battle. After Horribella tries and fails, Cloudia goes to Barque to meet with the Council of Elders. They decided to invite a new child, Happy, to Fairyland. If Happy is able to find the key and open the door back home before Gertrude, Gertrude will no longer be considered a guest, and the queen would have free reign to kill or punish her. Happy comes to Fairyland and is also given a guide, named Ms. Lady, and a map! Gertrude and Happy meet, and we see Happy has some powers of her own. If Happy gets the key first, Gertrude will also be stuck in Fairyland forever. She decides to try to wield the power of the seven evil dooms, so she goes and talks to Lord Darketh Deaddeath where he makes Gertrude prove her worth. Happy finds the key first by performing good deeds. Fairyland has a goodbye party for her, and she’s almost out the door when Gertrude crashes the party. Gertrude ends up getting the key by defeating Happy, but before she leaves to return back home and fulfill what she’s been after for twenty-seven years, she makes a grave mistake: She kills Queen Cloudia which, by the rules, makes Gertrude the new queen of Fairyland, and the door back home vanishes. This was such an amazing journey. I loved every issue, and couldn’t put this down. I cannot wait for Volume Two, and plan to buy it the day of release.